Before its early October release, positive word of mouth and plenty of hype had been building around director Alfonso Cuarón’s Gravity, his first film since 2006’s dystopian drama Children of Men. While plenty of curiosity has been milked out of its vague promotional campaign, Gravity is so much more than a movie about people floating around out in space. Mind you, it very well could have been and it still would have impressed through its special effects. No, Gravity is an inspiring tale about drifting through existence and never giving up even when it seems like things are lost. 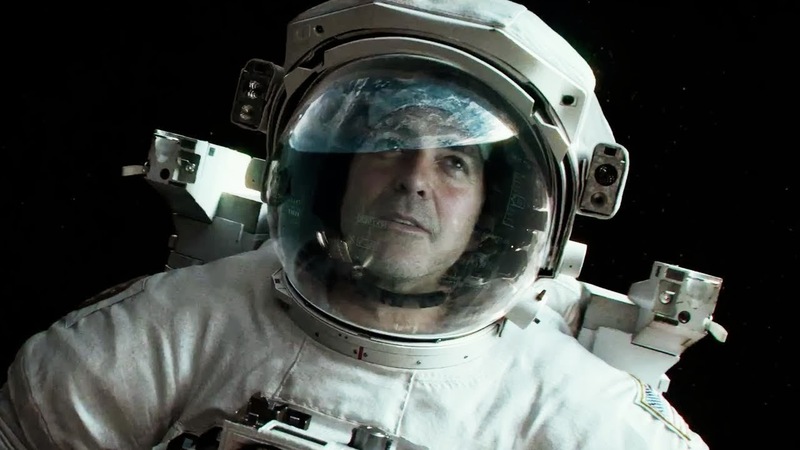 Guided by powerhouse performers George Clooney and a never-better Sandra Bullock, Gravity consistently holds its own with its stunningly emotional performances that bare heart and soul, a truly amazing accomplishment because the human side of the film could easily have gotten lost in all those CGI stars. Speaking of those CGI stars, Gravity is crafted through some of the most amazing special effects and 3D you may ever see. If this film is playing in 3D in a theater near you, you owe it to yourself to shell out the extra money to see it in that immersive format. It’s absolutely essential to the overall experience. Gravity tells the story of Dr. Ryan Stone (played by Sandra Bullock) and Matt Kowlaski (played by George Clooney), two astronauts aboard the Space Shuttle Explorer. While carrying out a bit of maintenance on their shuttle, Ryan and Matt receive a warning about debris from a destroyed Russian satellite rocketing their way. Ryan and Matt acknowledge the warning, but they don’t seem to be too worried about it. Matt is having a grand old time gliding above Earth with his thruster pack and Ryan is busy trying to hold down her last meal as she tinkers with the ship. Suddenly, what seemed like a minor threat only moments ago appears in the distance and the debris from the satellite rips apart the Explorer. In the midst of the destruction, Ryan is detached from the shuttle and launched out into space. With oxygen low and very few options, Matt begins trying to rescue Ryan and lead her to the International Space Station to regroup. Over the course of the rescue, Matt and Ryan get to know each other, and they reveal sensitive parts of their personal lives. But their fight for survival is disrupted when the debris that destroyed their shuttle descends upon the International Space Station and threatens to destroy their only hope for survival. Placing the viewer inside the space suits and allowing us to assess the situation through the eyes of the characters, Gravity continuously keeps us on the edge of our seat. In the opening ten minutes, you’ll be allowed to marvel at the sublime beauty of space as Cuarón lets his camera float around without a cut in sight. You’ll feel like you’re right there with Matt and Ryan, swapping stories and jokes as Earth glows brightly below you. In 3D, it’s even more phenomenal, giving you the sensation that you’re actually floating around in the stars. I’m usually indifferent to 3D, but I must say that Gravity could very well be the greatest 3D film ever made, rivaling the neon fairy tale word that James Cameron ushered us into with Avatar. This was also the first time that 3D actually started to make me feel a bit nauseous through Cuarón’s continuous movement. When the satellite debris hits and Explorer is reduced to tiny little pieces of shrapnel, the beauty is replaced by terror. You’re consumed by the idea of getting sucked out into infinite darkness with very little hope for rescue. You’re just left to drift and count the minutes until it’s all over. It’s made even more gut wrenching when we begin hearing about a tragedy that rocked Ryan’s life not long ago. 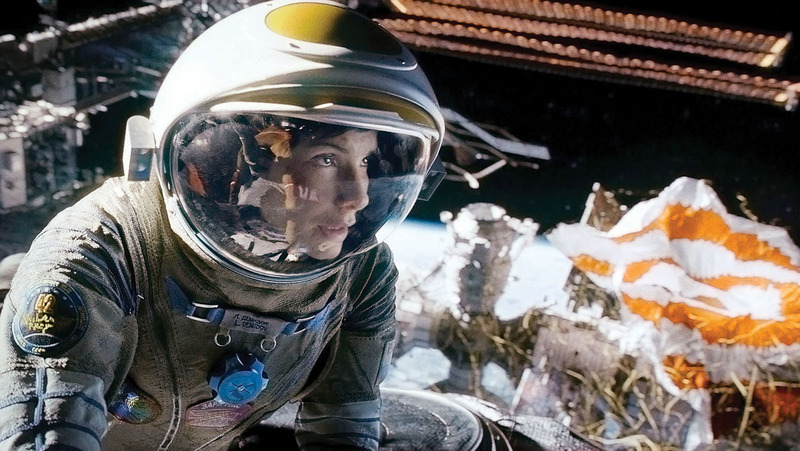 Considering that Gravity is limited to only two main characters, Cuarón recruits two of the biggest names in Hollywood to orbit Earth. Clooney is his usual dashing self as the lighthearted Matt, the guiding light to Bullock’s Ryan. He’s full of jokes about his good looks and he gets a chuckle out of sharing the same stories with both Huston and Ryan, both of which groan when he starts rambling on. Meanwhile, Bullock gives an exhausting performance as Ryan, a broken-hearted astronaut who appears to be drifting through her own life in addition to drifting about in space. It’s best not to reveal too much about her character, but you truly feel like you get to know her inside and out. Her pain pricks your heart and her successes will make you swell with hope. I’d personally be surprised if we don’t see her name in the Best Actress category at the Oscars. Overall, while Gravity is a technical wonder that will continue to amaze many years down the line, Cuarón really delivers a knock out through his story of rebirth. It becomes a classic tale about coming back from tragedy and pushing on even when you’re convinced there is nothing left to fight for. It’s a celestial blast of hope that could very well be the finest film of 2013. Posted on November 3, 2013, in REViEW and tagged 2013, alfonso cuarón, drama, george clooney, sandra bullock, science fiction, thriller. Bookmark the permalink. Leave a comment.